How Do I Begin Gambling? Vegas Time personnel are positioned at the front doors of the `casino’ (ballroom, house foyer, etc…) where they will hand out funny-money to each player in attendance. Traditionally, each player receives 50,000 worth of funny money. Minimum bets at the tables range from 500 to 2,000. 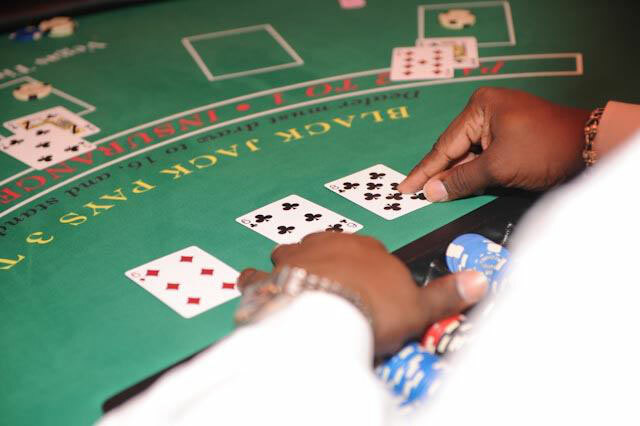 Players may then proceed to any gaming table where they can exchange their `bills’ for gaming chips. Vegas Time provides gaming chips of varying design and denominations. Chip values are printed on each chip and read: 500, 1000, 5000, 25000, 50000. For a nominal cost, Vegas Time offers professionally printed `custom’ funny money with an individuals picture, a company logo or company name. For samples, click on the `game pictures’ icon on the left hnd side of this page. Our print vendor has been in business for over 20 years and customizes each order to your specifications. What If I Don’t Know How to Play a Particular Game? Vegas Time staff are professionally trained on all table games and are eager to teach the novice gambler the rules of the games. Our professional staff encourages each person in attendance to participate, regardless of their knowledge of the games. 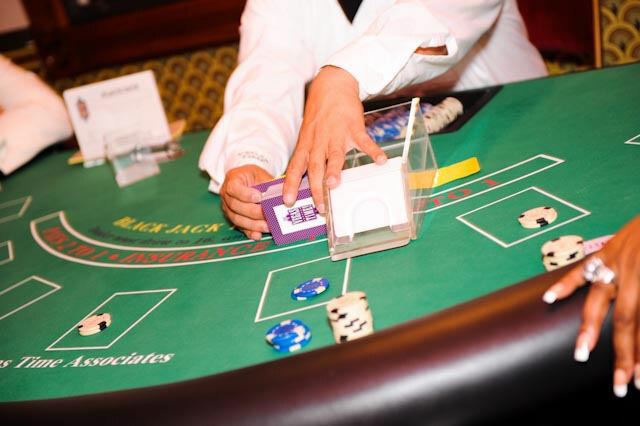 Since casino themed events is our only line of business, your dealer is well versed in all games. Your dealer was a craps dealer last week and will be a craps dealer next week. He/she willnot be a moonbounce operator next weee or a cotton candy machine worker since casino games is our only line of work. What Happens at the End of the Party? Usually, the host arranges to have prizes awarded at the end of the evening. There are many ways that Vegas Time Associates can assist you with the close out process. One way is to award prizes based on the players winnings at the gaming tables. At the close, our staff tallys up each players winnings on a casino voucher. The Pit Boss arranges the vouchers in numeric order, highest to lowest, and will present these vouchers to the host approx. 20 minutes after the close of the casino. The host will then make an announcement of the top money winners. Yet another way to award prizes is through a raffle drawing. At the close of the casino, players cash out their `winnings’ with any Vegas Time dealer. In exchange for the players bills and/or chips, the dealer will give players a two-part raffle ticket. Traditionally, for each 10,000 turned in, the player receives one two-part raffle ticket. The host usually arranges to have a raffle drum, prize bag(s) or bowl where players can deposit one part of the two-part ticket. After all tickets have been deposited into the bowl, the host draws tickets and reads the six digit serial number off the ticket. Players with the matching serial number step up to receive their prize. Vegas Time Associates, Inc. will provide the Casino Vouchers or Raffle Tickets at no additional charge. When do you take the gaming tables away? As your party is concluding with the prize ceremony, our professional staff are quietly packing up all the supplies used during the event (cards, dice, chips, tickets, etc…). After putting away all accesories, we begin exiting th venue with both the tables and the accessories and place the on the Vegas Time vehicle. 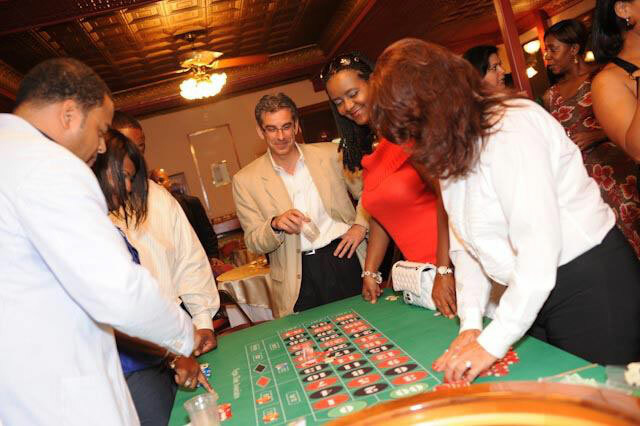 Vegas Time Associates works with many groups, organizations and associations conducting casino night fund raisers. The information below will assist your group in planning your next fundraiser by adding a little CASINO EXCITEMENT! to the event. Let Vegas Time make your next fundraiser a financial success! 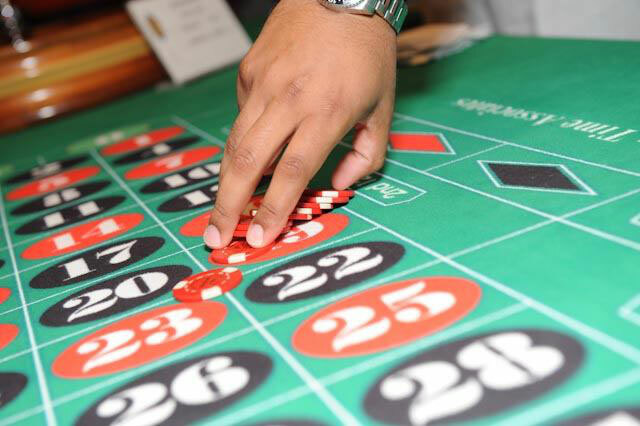 An important aspect of a successful and profitable casino fundraiser is attendance. Planning the event months in advance will help assure a great turnout. Getting the word out via radio ads, print ads, flyers, etc… will greatly help those all important advance ticket sales. Advance notice allows your target market to make plans and set aside the date to attend the casino night fundraiser. There are three revenue streams you may look forward to in planning your next fundraiser. A. Ticket sales B. Gaming table sponsorship C. “Funny-money” sales. Through careful planning, these three revenue sources will not only pay for entertainment (Vegas Time Associates) but also the hall rental and food expense and still leave numerous dollars for the desired charity. Traditionally, our clients will charge X amount of dollars per person/per couple for attending the event. You may wish to discount advance ticket sales as an incentive to garner a greater number of advance sold tickets. An increased `at the door’ ticket price is customary. For the cost of the ticket(s)/donation(s), guests are invited to eat, drink, socialize and participate in authentic style gambling. Vegas Time recommends whetting the appetite of your guests by starting each person out with seed money. Traditionally, each player receives 10,000 worth of funny money. You can expect the average player to run out of his/her 10,000 allotment within the first 30 minutes of play. You may wish to set up a designated casino cashier or casino runners to sell additional funny money script throughout the event. Funny money sales are an important aspect of the fundraiser. This is where you want your guests to dig deep into their pockets so you can generate a lot of income for the designated charity. Having casino runners permits the players to stay at their gaming table and not lose their spot while still being able to access the cashier to purchase more funny money. Vegas Time recommends selling one 10,000 funny money bill in exchange for $10.00 in U.S. Currency. Depending upon how sales are going through the night, you may wish to have a SALE and offer 20,000 of funny money for $10.00 for a brief period of time Another source of income for the charity is to sell sponsorship in each of the table games. You can visit local merchants and retailers in your area and ask for cash donations to the charity. In exchange for the merchants/retailers cash donation, Vegas Time Associates can place the company name on each of the gaming table signs. You may also wish to publish a brochure that lists all sponsors along with their address and phone numbers. Essentially, the merchant is buying advertising but at the same time creating good will within the community by showing that they believe in the charity and want to participate in its’ success. Of course, your guests are not really gambling. Players are not permitted to turn in their chips for cash. Instead, our clients arrange to award prizes based on players winnings at the gaming tables. One way to finish the event is to conduct a raffle for prizes. In this chosen method, players will turn in their `winnings’ to the casino dealers in exchange for raffle tickets. It is customary to hand out one raffle ticket for every 10,000 turned back into the dealer. As an example, if you turned in 70,000 to your blackjack dealer her/she would give you 7 raffle tickets. Players are then instructed to place their raffle tickets in designated prize bags (if multiple prizes are offered) or one raffle drum/prize bowl if one prize is offered. Another prize method is `Top Money Winners’. Players are asked at the end of the evening to turn in their bills and/or chips to the casino dealers. The dealers tally up each player `winning’ and create a casino voucher with the players name and his/her total cash in. The casino manager will collect the vouchers from the dealers and put then in order (most winnings to least winnings). Once you have received said vouchers, you simply make an announcement as to the name(s) of the winner(s). Yet another method is a live auction. Players cash in with the dealers and walk away with an auction receipt. You then conduct a live auction for prizes with the guests bidding on prizes with their casino winnings. It is customary to allow players to bid over their receipt amount in exchange for making up the difference of the winning bid by cash, check or credit card. Hopefully, this has given you some insight into the ways to successfully run a casino fundraiser. Should you have any further questions, please do not hesitate to call our casino professionals at Vegas Time Associates and let them assist you in your next fundraising effort.